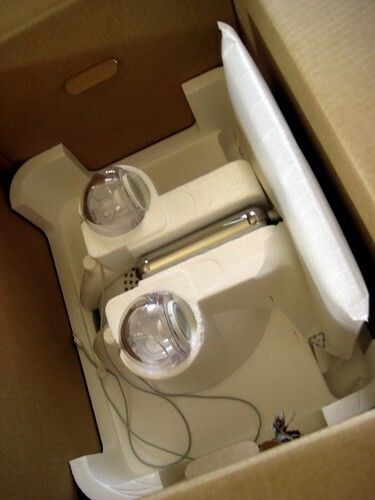 Newton Poetry — Out of the box: iMac G4 arrives safe and sound. I purchased the iMac off eBay for a bargain $200, and look at how well the seller packaged it. It’s like opening a brand-new model. 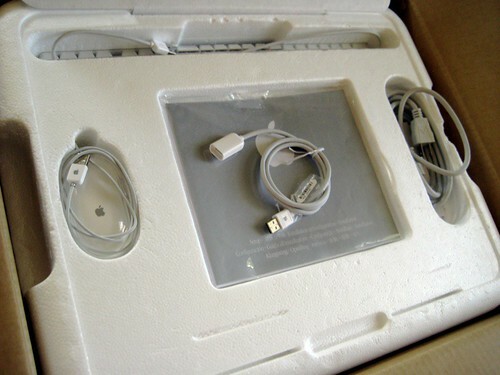 It came with everything: pro mouse and keyboard, speakers, extra USB dongle, manuals, power cord – all in great shape. 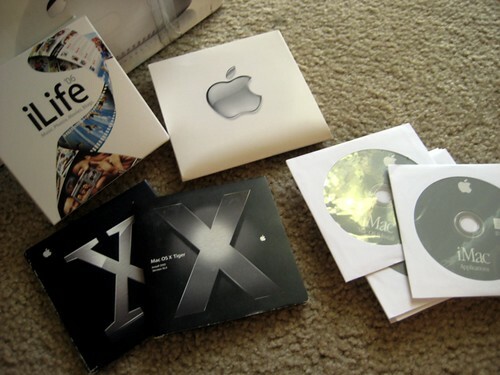 Including iLife ’06, OS X Tiger and Panther, 10.1, and OS 9, plus the software restore CDs. Talk about a jackpot. Just the OS X discs are gold. And I can finally install a version of iWeb to play around with. Talk about handle with care. This 15″ model wasn’t going to budge. Ah, finally out of the box. My love affair with G4 iMacs began in college, when they were first released, and I vowed to get one – but not pay a premium. Well mission accomplished here, friends, because this iMac is in beautiful condition. It’s, by far, the loveliest design of the entire Mac line since the G3s were released. Only the Mac mini, in my eyes, comes close to this kind of elegance. 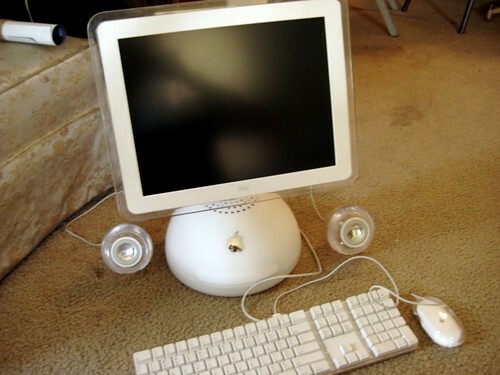 I really wanted a 17″ or larger model screen, but any iMac G4 is better than none at all. The one cosmetic flaw I found, besides a dirty keyboard, was this clear goo on the back of the LCD. Some of it flakes off, but I might need some Goo-Gone to clean it off. Magic eraser, anyone? The manuals were fun. Check out the first-gen iPod on the right. 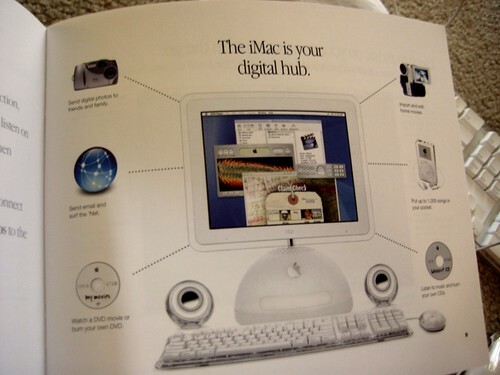 I wasn’t such a Mac geek when all this stuff was first coming out, and I’m sorry I missed all the excitement. There it is – the whole setup. It bonged just fine when I plugged it in and turned it on. It’s running Panther, and it’s damn snappy, too – even at only 800 Mhz. Soon it will be running Tiger, and I’ll see how far I can push it. With only USB 1.1, though, there will be no iPod or iPhone plug-ins. The only G4s I’m missing are the PowerBook, Cube, and Mac mini, but I’d really rather snag a G5 someday, just to say I had all three generations of the G-series. Intel? That’s somewhere down the road, too. Oh wow. It’s looks as good as new too. That’s gorgeous. I remember very well when this was announced – it was the first iMac that I really fancied (the fruity flavours held no appeal for me). 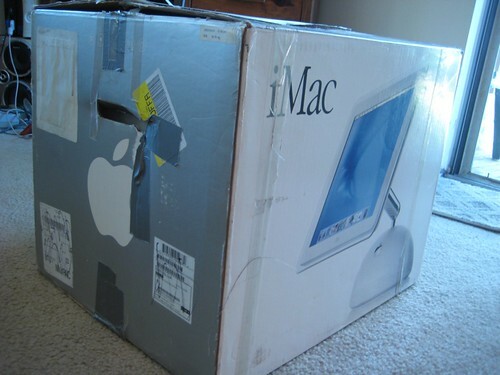 Alas, it wasn’t to be – my first Macintosh ended up being the beloved PowerMac G5 that still serves as my main computer today. Have fun with your new toy – I know I would. Posted by urbanmainframe on August 27th, 2008. Yes I agree with urbanmainframe, it does look brand new. Except for that goo on the Apple Logo. I see in one of the pictures you have a Mac OS X 10.4 Tiger box, are you going to install Tiger because you think it might run Leopard too slowly? Posted by jrem95 on August 27th, 2008. Want to see something you’ll just absolutely drool over? This is my friend Brad’s studio section of his apartment. Posted by Ash on August 27th, 2008. Ash: yes, I’m drooling. 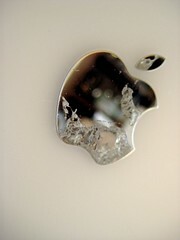 A new, aluminum will be my eventual “upgrade” Mac, whenever my trusty iBook poops out on me. urban: the G5 was the first Mac I saw in person that just hit me with a sense of awe. I think it’s the industrial design: it looks like it could literally kick other PCs’ asses. jrem: I think I’ll hold out on Leopard (or Snow Leopard) until I get a brand-new Mac. I’m not big on installing new OSes on old hardware. Posted by davelawrence8 on August 27th, 2008. Posted by pacer521 on August 27th, 2008. Finding inexpensive macs is an awesome solution. Sounds like you got a great deal. Posted by MOAT on August 28th, 2008. Great purchase! I bought a used 17″ 800 Mhz a few years back to use for video editing and it has worked flawlessly. I love used iMacs so much that I’m setting my two oldest daughters up with them for school. My 10 yr old is getting the 800 MHz G4 and I bought another G4 17″ (1 Ghz) on eBay for my 13-yr old. For myself, I upgraded to a Imac G5 20″/1.8Ghz/250GB HD that I bought for $710 (inlc S&H) also on eBay. To round out my collection, I have an original G3 iMac as well that the kids have been using since around 2003. No plans to get a mini or cube, but you never know! Posted by craig iskowitz on August 29th, 2008. WOW! Thanks for sharing your unboxing with us! This is my favorite iMac too. It came out new my senior year of college back when I was using a Performa still. I spent many a hour drooling over it in the CompUSA but alas with student loans and a mediocre job one of these was just a fantasy. I plan to find one of these when (someday) I open my studio/gallery. I hope it is as nice as yours! Posted by VInce LoGreco on August 29th, 2008. 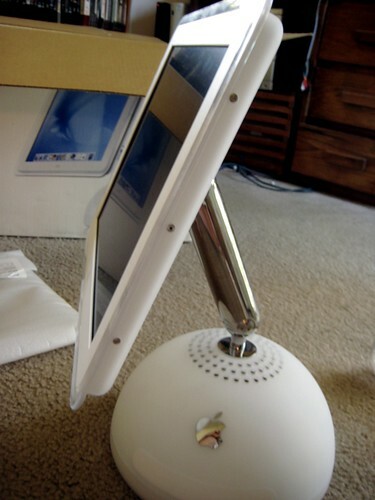 Craig: the 17″ is my ideal iMac G4. In fact, I’m thinking about setting this one up and posting it on eBay, see what I can get out of it, and then tackle the 17″ – but it would be hard to find one in as good a condition as this one. Vince: I hope yours is, too. I saw the box on eBay and figured, “Okay, cool, it’s got the original box.” Never did I imagine it would be in such good condition. Posted by davelawrence8 on August 29th, 2008. Posted by steveballmer on August 29th, 2008. Some good news: my iPhone and iPods work just fine with my G4 iMac 700. Although USB1.1 isn’t officially supported, it works without problems albeit pretty slowly. I think it’ll have to have Tiger installed before your iPhone will work, however, plus the usual software patches naturally. Nice pick up though! Posted by Jack on September 12th, 2008. Jack, I wondered about that. But I still won’t try my 30 GB iPod with USB 1.1, unless I have an entire week free. Posted by davelawrence8 on September 13th, 2008. I have begun collecting MAcs after a year of building up a lot of vintage Apple computers. TO source many of these means going thru ebay and I have now bought 4 G4 “sunflower” Macs to go with my also newly aquired G4 Cubes ( the other amazing Mac ). Finding these in their original box’s is an added bonus. I have over 80 vintage macs and Apples, but lack the space to dispplay thyem – one day I will have my own museam. Posted by John Chaplin on September 22nd, 2008. Posted by Update: iMac G4 still humming (quietly) along « Newton Poetry on October 1st, 2008. Posted by Newton Poetry — What’s your favorite Mac? on January 23rd, 2009. Posted by Newton Poetry — iMac G4 for sale on October 24th, 2009. Posted by Newton Poetry — On my Mac hobby on March 2nd, 2010. 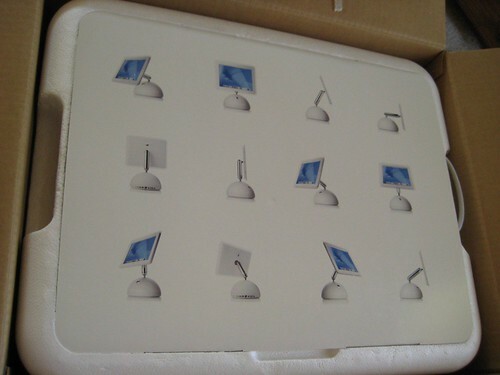 Posted by Newton Poetry — Reviving an iMac G4 for every day work on November 23rd, 2010. Posted by Nickron on December 31st, 2010.